Adopting a new frame of government also required Americans to make a leap of faith. After a long war and many disputes, supporters of the U.S. Constitution declared the need for a stable, central government to “secure the blessings of liberty” to Americans. But could the growing nation pull together? The states had not always cooperated with one another. Congress had been too weak to counter European and Native American powers or to settle conflicts within or between states. Delegates to the Constitutional Convention agreed to shift power to the central government. At the same time, they provided that federal government officials be elected, either directly or indirectly, so as to represent the people as a whole. 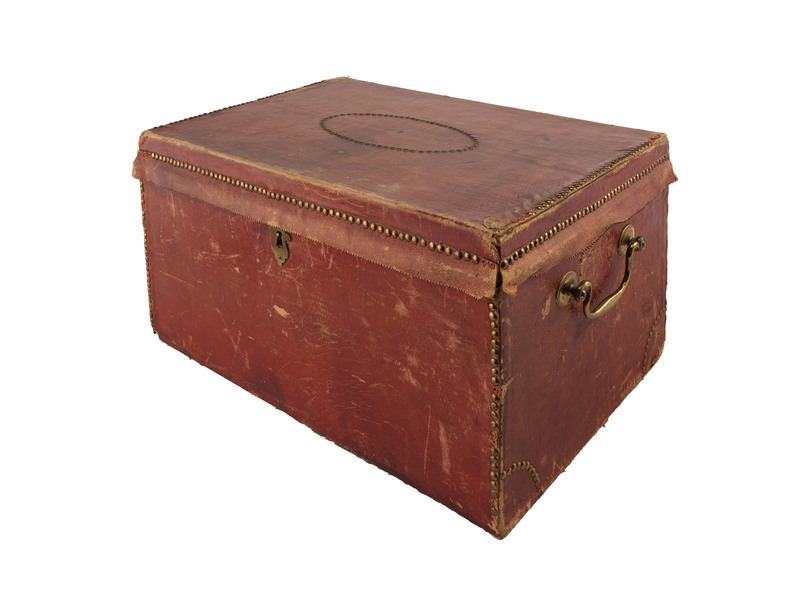 George Washington, who presided over the Constitutional Convention in 1787, used this small box to preserve papers produced by the convention. In September 1787 Americans had their first chance to see the new constitution proposed by a convention in Philadelphia. Over the summer, the convention had met in private, allowing no press coverage of their debates or decisions. The Providence Gazette and Country Journal was among the newspapers that first published the plan. What followed was a broad debate that Alexander Hamilton called a “Great National Discussion.” Should the states ratify, reject, or amend the document that became the U.S. Constitution? Members of the convention that formed the U.S. Constitution generally shared a goal of shifting power to a central government and away from state legislatures. They also agreed that the new government should directly represent American voters. The Massachusetts Centinel newspaper published a series of images showing each state that ratified the proposed constitution as a pillar that, standing with the others, would create a new edifice. This image from January 1788 depicts the first five states to ratify, in order from left to right. Massachusetts would ratify on February 7, 1788. But they disagreed on many issues. The constitution they created was the product of compromises—between populous states and small ones, slaveholding states and free ones, states with claims to western lands and states without. Equally important, the delegates had to compromise with the ideas of more common people in order to win ratification by the states and acceptance from the people. 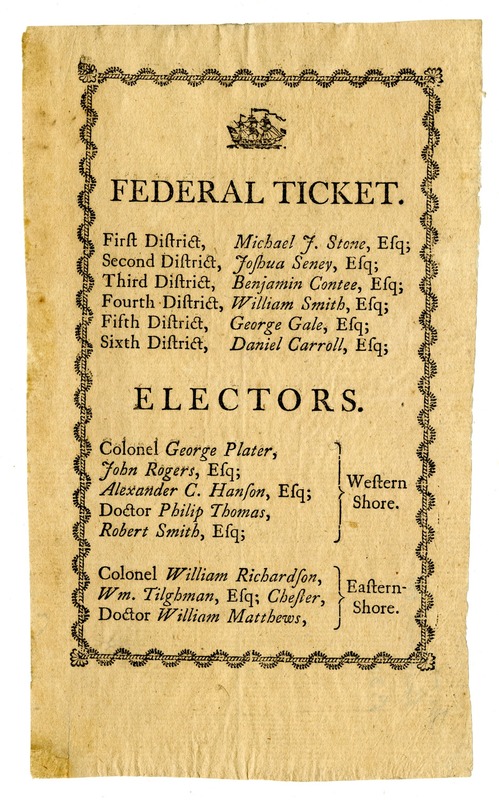 This ballot names four men to serve as members of Maryland’s delegation to the Electoral College in the first presidential election under the U.S. Constitution, in 1789. The Constitution allowed state legislatures to choose their own preferred method of selecting members for the Electoral College that would in turn select the president. Five state legislatures directly appointed members, while others established various systems that allowed voters to have a voice. In Maryland the voters at large, nearly eight thousand men, voted for presidential electors in 1789. Every state’s electors voted for George Washington to be president. The adoption of the U.S. Constitution only began the discussion. Many people insisted on amendments. The first Congress passed the Bill of Rights in 1789. These ten amendments protected institutions that many Americans considered essential to a free people, including a free press, free institutions of worship, armed militias, public assemblies, trial by jury, and freedom from unlawful searches and seizures. 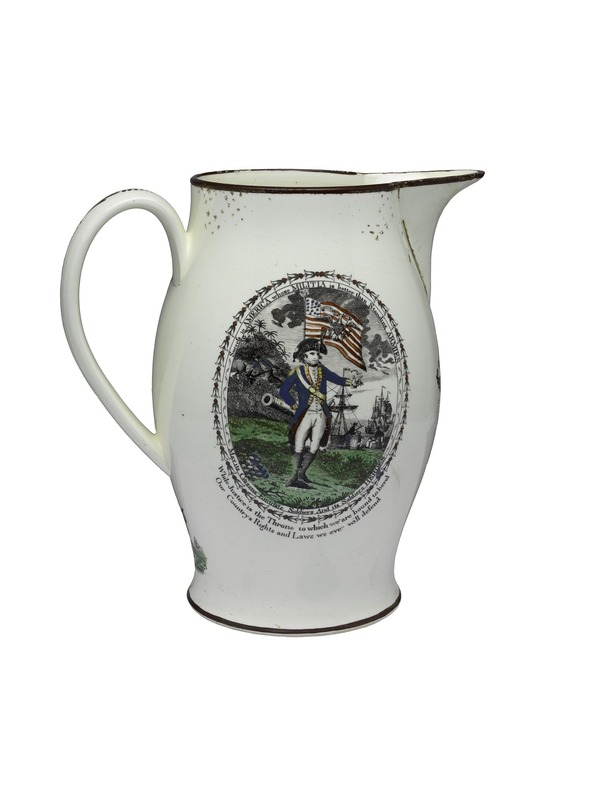 Pitcher, "Union to the People"
Creamware pitchers decorated with transfer prints, commercially made in England for American consumers in the 1790s and 1800s, celebrated the nation’s commitment to civil and religious freedom and a system of state militias. 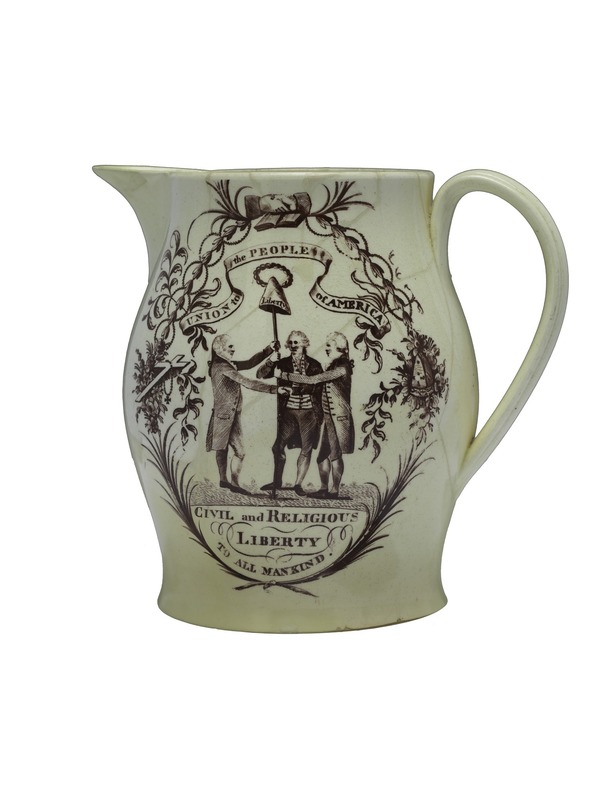 A creamware plate, from the 1830s, records the first amendment in honor of printer Elijah Lovejoy, who was killed by a mob in Illinois for publishing anti-slavery ideas.